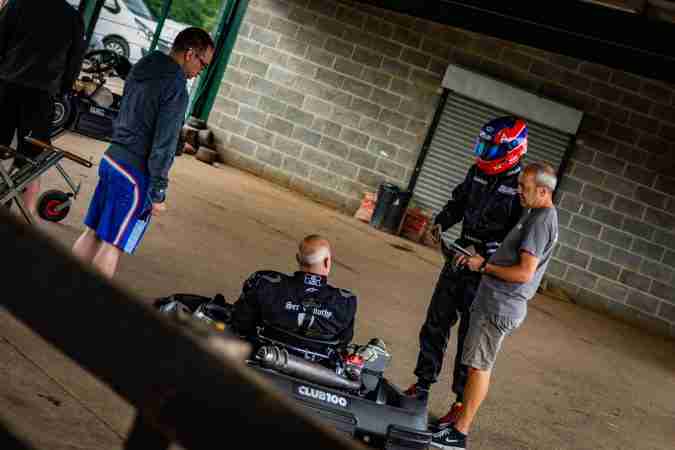 Firstly, you need to become very familiar with the CLUB100 Birel karts’ handling characteristics on the limit, on cold tyres, and in heavy traffic. As CLUB100 is an “arrive & drive” series you will probably be driving a different chassis in each of your races in a day, so you need to be able to isolate the slight differences in each kart, whether related to engine and/or chassis, and then use those characteristics to your best advantage, while covering any minor kart deficiency with your skill as a driver. So there’s a lot to learn for the CLUB100 first time Sprinter. However, this shouldn’t put you off. There’s plenty of help on offer for new drivers to the series, whichever level. If you are serious about taking your skills to the limit up against another 60 drivers (per class) then this is the series for you.